To follow up yesterday’s QCS Vetiver soap review, I’ve now got the first of the shaving creams I’ve tried from Queen Charlotte Soaps; thus far I like it better than the soap samples. It seems to have a bigger “sweet spot” of water needed for a good combination of lather thickness and lubrication. It used, well, about an average amount for most other creams that I’ve come across. It’s a fairly thick cream, not sticky or goopy, honestly I would almost call it a really soft soap, consistency-wise at least. As a reminder, I redid the lather quality scoring system, what used to be a 9/10 has been split into 9/10s (former “high 9s”) and 8/10s (former “low 9s”). The scent, well, it’s menthol and peppermint. I generally like a bit of menthol, and enjoyed giving this cream a sniff. It’s when I lathered it up and put it on my face that I rather stopped enjoying it. It’s strong. Very strong. “Enough menthol to make my eyes water” strong. I know that’s kinda this cream’s gig, and I should have expected what was coming. I mean, they say outright that “Vostok is a face-freezing blend of ice-cold peppermint and blizzard-like blasts of sub-zero menthol. We do not believe there exists a colder shaving product”. But I was still a bit unprepared for just how much freezing-action hit my face. It was just bloody cold. If that’s what you’re going for, fill your boots. But I don’t think I’ll be trying this one again any time soon. Maybe to make a bit of superlather if I want to add a bit of a kick to some other scent, making sure not to use too much of course. This wasn’t really what I consider to be a very pleasant shave. 4/10. Your mileage of course, may vary if you really like the cooling action. Cost: Queen Charlotte’s cream samples are 5 for $8, but with a surcharge for certain scents, bringing the price for this particular sample to $2.10. A full tub will run you $16. Ingredients: Water, saponified stearic acid, glycerin, saponified tallow, palm oil, olive oil, and coconut oil, aloe vera extract, essential oil(s), kaolin clay, phenoxyethanol (and) caprylyl glycol, vitamin E. Vostok contains menthol crystals. 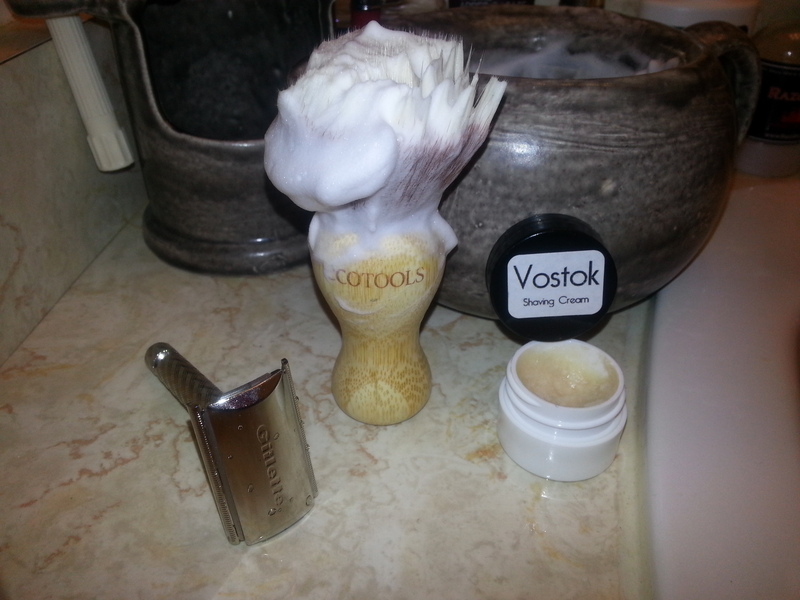 Vostok must be a love-it-or-hate-it soap. I’ve used the cream several times and like it more each use. This may be an acquired thing. For me, the menthol just builds through the shave and lingers for an hour or more after. No other shave soap that I’ve tried does this. Perhaps, menthol is like anise, licorice or other strong, pungent flavors. Really enjoy your reviews, thanks! Indeed, in everything, your mileage may vary. I honestly can’t say that my reviews will ever be objectively correct. What I hate others might love. I will however shoot for being as consistent as I can.